The process of buying the ticket can be a nightmare as the Renfe site only is available in Spanish and you can only buy your ticket using the Spanish page. We have managed it ourselves, but you should prepare to use at least 30 minutes in the process of ordering the tickets, combined with using Google Translate to understand everything. 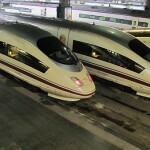 Their webpage is available at www.renfe.es. As you buy your tickets you just have to print them out and bring them to the train station where you should be around 30 minutes before departure, just to make sure that everything is okay. 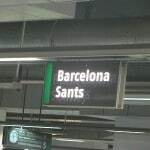 The Renfe trains normally leaves from Barcelona Sants (metro stop is Estacio Sants) in Barcelona and the trains arrive to Atocha station in Madrid (Pta Atocha is the name on the ticket), which is on the metro stop “Atocha Renfe”. If you would rather enjoy this trip using an airplane the cheapest fares can be reached using Vueling.